When pigs attack: Do livestock intentionally kill people? How often do livestock deliberately kill farmers? 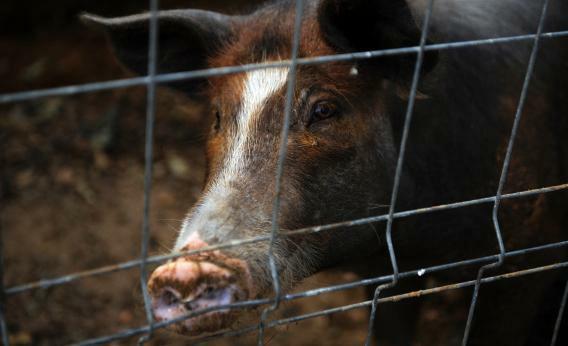 An Oregon farmer was eaten by his hogs on Wednesday. The 70-year-old Vietnam veteran had gone to feed the animals in the morning, and his family found his dentures and scattered remains in the hog pen several hours later. Authorities are trying to determine whether the pigs deliberately killed the man. Do livestock intentionally kill their owners? Yes. Cattle kill approximately 22 Americans per year nationwide, and the animals deliberately attack their victims in 75 percent of those cases, according to a 2009 study. About one-third of bovine killers have a history of aggressive behavior. Swine likely kill fewer people than cattle do, but there are no reliable data on this question. The CDC’s mortality statistics group together all mammal attacks apart from those perpetrated by rodents, dogs, and humans. The death count in the mammal-attack category averages about 73 per year, including cattle-related mortalities. There are, however, plenty of anecdotes suggesting that swine are willing and able to kill humans. British pigs seem to have a particularly aggressive streak. In 2006, a 650-pound swine pinned a Welsh farmer to a tractor and bit him until the victim’s wife scared the attacker off with a water hose. The same year, a pig foraging in England’s New Forest—a hunting ground where farmers pasture their swine—caused a horse to throw its rider, then mauled the prone woman. Livestock display an alarming ability to coordinate their attacks. A herd of cattle circles up to confront a perceived threat, with their backsides in the center of the circle and their heads lowered. They may even paw the ground, like a bull facing a matador. Of the 21 cattle-related fatalities in the Plains states between 2003 and 2008, five involved multiple animals swarming the farmer. Pigs are also known to attack cooperatively. In 2007, a sow in Norfolk, England knocked a farmer off his feet, enabling the other pigs to bite the man. If confronted by an agitated pig or cow, back away and get behind a barrier such as a tree. It also helps to carry a large stick as a weapon and to make yourself appear larger.